When finding an option in a Combo Box, click inside the box and enter the first few letters of the item. The selection will filter the data to show only the items beginning with those characters. 7) To find an item, hold down the CTRL key and press F. In the Find What box, type in the text you want and click on FIND NEXT. Sometimes, when entering data in a text box, pressing ENTER causes the cursor to skip to a different control. If that is the case CTRL + ENTER will insert a newline in that text box. Text can easily be copied from other documents, from emails or from the Internet to put in your data. To do this, select the text you want to add, press CTRL + C (copy) and click in the Text box you want to copy it to and press CTRL + V (paste). 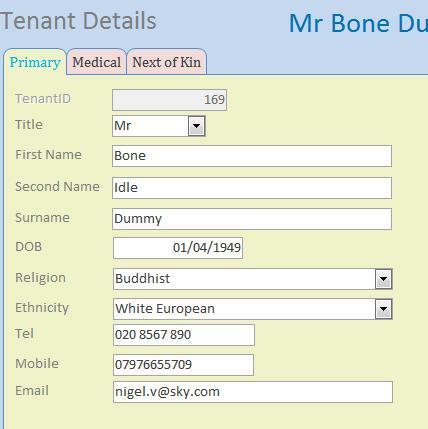 You can also use this technique if you have entered data in the wrong box. Select the data and use CUT (CTRL + X) to remove it from one field and CTRL + V to paste it into another one. Sometimes it is difficult to select the whole record. A really useful tip is to click anywhere in the previous record (press Shift TAB) and then press TAB. The whole record is selected. To see the whole field, click into the text box and press Shift and function key F2. A Zoom box appears showing the whole field. b) The text may be cut off after 255 characters have been reached. In Europe, enter Day /Month/Year in the form dd/mm/yy or dd/mm/yyyy using leading zeros. Years can be two digit or four digit. Eg 6th May 2010 can be entered 06/05/10 or 06/05/2010. In the USA, the Months and days are reversed so that the US Christmas in 2014 falls on 12/25/14 or 12/25/2014. The CTRL key, the ALT key the SHIFT and Windows keys just modify the information sent from the QWERTY keyboard. So you can hold down these modifier keys first, and only when you press a character key is the information sent to the computer. So to add a date into a Word document, hold down the ALT and Shift keys and whilst holding them down, press D.